-A thin atmosphere misgivings in optical height variances is surely compensated by huge diurnal temperature variations. The long time quest for water on Mars has been resolved for some time, there is some, but it may be easier to find huge permafrost lakes by simply looking at the horizon line. Mars Permafrost, should be similar to Arctic permafrost, just as much as Arctic sea ice. Permafrost leaves a drier interface than water, but unlike water, ice is an insulator, like permafrost. In the Martian under shallow rock permafrost, the ground temperature should be kept colder than with thick dry rock layers. Rapid conduction sun forced diurnal atmospheric inversions are a feature found with sea ice, permafrost does the same. Martian atmosphere is 100 times thinner than on Earth, however there is one. Where there is an atmosphere there is atmospheric refraction. One must observe there more carefully. Ice warms or cools much slower than the Martian atmosphere, in a given substratum, a pure rock formation would vary horizon heights more significantly than one with permafrost. The way to detect a variation without multiple pictures taken from the same position would be to study wide horizon pictures which would bring out a profile look of an apparent "lake without water", the middle of this " empty lake" would appear deeper than "shorelines". The dry rock stratum would appear higher because rocks warm faster than ice. ~Its hard to interpret complex thermal systems, even harder to foresee what they will do. ~Warmest summer in history to come makes it somewhat easier. Double Katimavik sunset, a very artistic mesmerizing end of Arctic day. Katimavik is an Inuktitut word, from the language of Inuit people who live here, meaning meeting place, a once upon a time real place in 1967 Montreal. 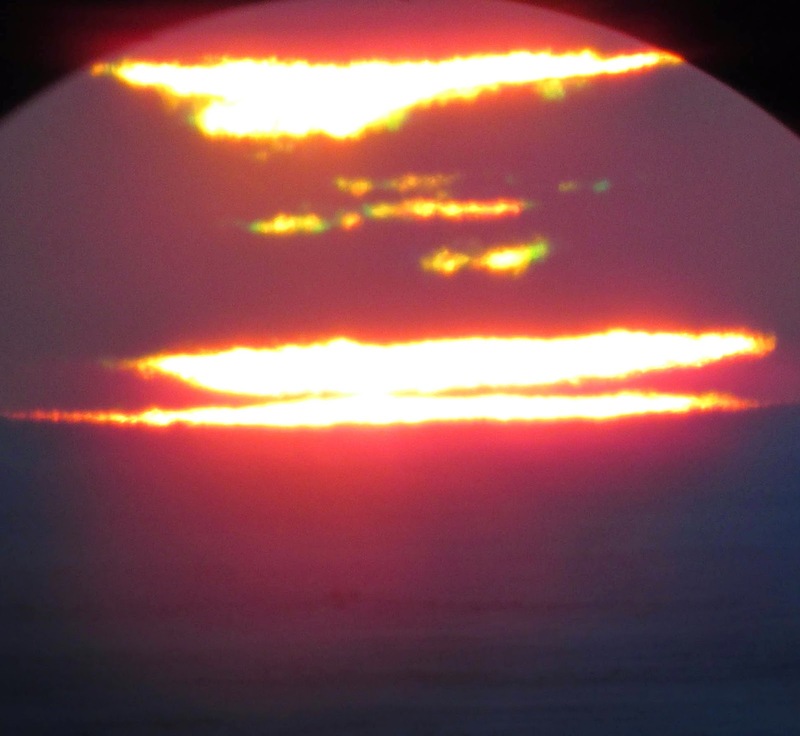 Echoes from the past repeated visually along with multi-coloured flashes above ( illuminated gravity waves ducts), was on March 26, 2015, a typical Northwest passage view from Southern Cornwallis Island. 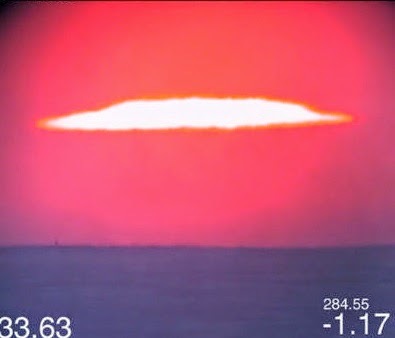 Green flash above the smaller Katimavik along a red flash below. With main sun disk image compressed vertically close to 20 times. These complex optical physics factors have significant meaning. 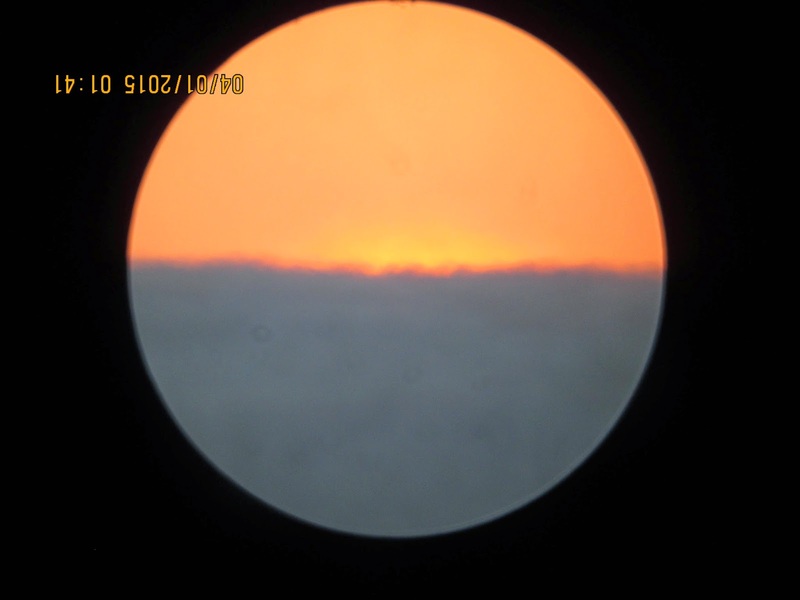 The compressed sun (picture above) kept its true colour with 20 times more atmospheric thickness. 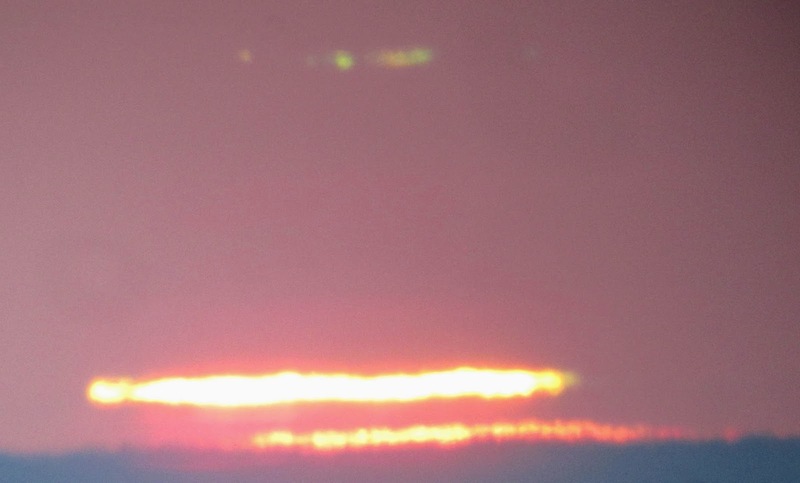 The high elevation green flash is a very delicate structure often not seen green because of aerosols or water vapour. Winter\Spring 2015 North American Arctic had exceptionally clean air more often than not. This implicates extreme warming of the Arctic as the sun rises progressively higher till 24 hour days, clear low in concentration aerosol days, will make surface air warmer. Exact sun positions when they disappear reveal the nature of the distant surface to air interface. In the Arctic, the rising spring sun creates a warm sea ice surface which cools rapidly in the evening on transient days between the long night and the midnight sun. Sea ice surface is cooling faster than air because of its colder than air inner core, when the core is warmed by conduction the surface ice cools, then the air right above does likewise. This creates an isothermal inversion which rises the horizon. If there is a strong inversion, the day lengthens, if there is a weak one or none the day shortens. Longest days are noted when the sun is seen when it is far below the horizon. A much longer day has a sun visible greater than 1.6 degrees below the horizon. In 2001 there was 10 extremely late sunsets, in 2015 , 2. Last year there was 4. This sunset in 2004 was picked to compare with 2015's greatest Northwards Shift. It lasted till the sun was last seen at 2.09 degrees below astronomical horizon and located 285 degrees azimuth, 15 degrees Northwards of true geographical West. 11 years later on same March 24, the sun disk at Akhet (when the sun touches the horizon) was much larger, this is an indication of weaker over all inversions. Sunset was 1.9 degrees below the horizon, the latest day length extension by refraction since sunrise from the long night of 2014-15. It was last seen 283.21 degrees azimuth, a full 1.8 degrees Southwards then when a past colder sea ice was formed over the winter of 2003-04. 1.8 degrees is a huge distance, roughly equivalent to 4 sun diameters. 2008 was the last time the sun line was seen sliding down hill for about 1 minute, a classified phenomena called toboggan sun, but on initial anniversary in 2001 it slid further down for 3 and a half minutes. 2015 on same March 31 day, the sunset was 7 minutes earlier than 2008, a very significant shortening of the day. The toboggan stopped short on top of the hill not touching the downward slope, as if a true toboggan on rocks instead of snow, but at end of March 2015 the sandstone gravel hill top was indeed barer and much warmer killing the chance of surface to air steep inversion ducting. For Toboggan Sun to exist, the ground surface must be very much colder. Recently learned fantastic discovery of judging whether underside ice is melting or not reveals very interesting relations with weather and whether sea ice underside melts even when temperatures outside are as cold as -35 C. I am in the process of discovery from horizon elevation data lines, whether more melting happens when its not windy, windy, cloudy, or with an optically thick aerosol rich atmosphere. What is reasonably known is subsequences after First Melts. A very low September Minima starts from a very early consistent daily cyclic thermal process. If sea ice horizon does progressively maintain the astronomical horizon and or increase in time maintaining this line every next day, the minima will be greatly reduced. So far, 2015 post FM true astronomical horizon increased in duration every day when observed. It signals hard to stop increasing diurnal melting periods. Like any engine, when an engine sputters its not as warm, as sea ice was in the spring of 2014 when astronomical line was seen erratic only more consistent in later May. A big Arctic Sea ice minima begins with a strong essentially regular ever increasing in time under-melt. because of a lack of snow cover by less snowfall and greater sublimation caused by unstable air from much more common than usual surface to air adiabatic temperature profiles. Despite 2015 sea ice greater accretion, its thickness was nowhere near past average thickness spanning the same distance of the light rays from the setting sun, the atmospheric light path. And so, sea ice horizon rises are directly proportional to sea ice thickness. masked the ice horizon risen 11.6 arc minutes, March 27 2004. 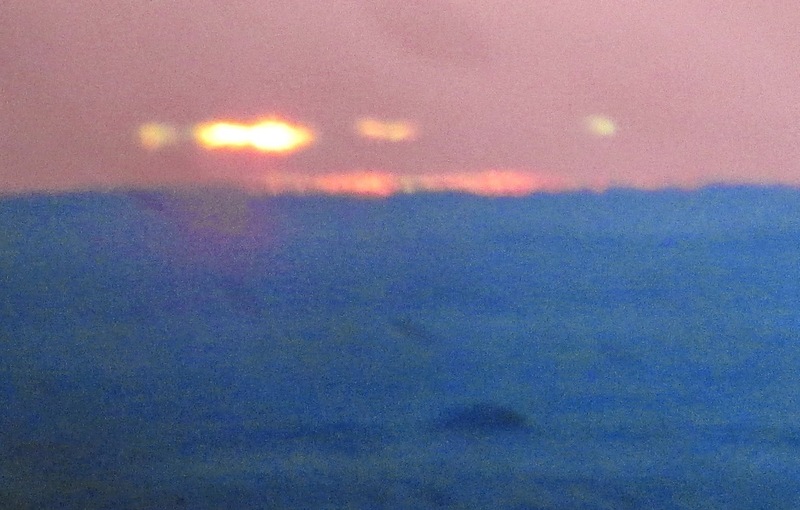 Near last sighting of the sun with 2015 clear air revealing ice horizon risen 5.8 arc minutes on March 27. From 425 observations compared with about 4000, clear weather was strong since end of February. With no apparent temperature change, 2002 to 2015 vertical sun disks would be 8.1% expanded from year to year. The last 5 of 6 years had more expanded sun disks than the previous 10 combined. An apparently totally new phenomena has been surging in the past 5 years, when a lower sun in the sky gives a greater size vertical sun disk than at a higher elevation. This defines an area of the lower atmosphere with a very warm layer of air, as the sun passes through this layer, it expands in size. There were many such captures of thicker warmer lower layers in the spring of 2015. The exact impact of such layering of warmer air is hard to fathom. of coldest atmosphere in the world. This forecast is not at all counting on El-Nino rising again, which undoubtedly guaranties more heat. Sea ice adds complexities, remaining Arctic pack is estimated thicker than past few years, yet we are presently at all time low extents. Horizon height measurements confirmed that first year sea ice of 2015 is indeed thicker than last year in the Canadian archipelago NW passage, but not because it was colder, but rather from dried up North Pole in provenance air as depicted here for nearly the entire dark season and current spring. It was astonishing, there was a nearly continuous flow of dry but adiabatic air (December onwards) which sublimated the sea and land surface snow cover of almost the entire North American Arctic sector. There is thicker first year sea ice in the Canadian Arctic sector compared to last year, but given that winter just past had one day with surface temperatures below -40 C over Cornwallis Island Nunavut Canada (for only a few hours in duration), local sea ice thickness didn't exceed all time maximums. However, extent is really more important because without ice sheet cover the sun warms the darker Arctic sea enormously due to more exposure time to sun rays which are very important, even when the sun is low in the sky, remember the Arctic has naturally very low concentrations of atmospheric aerosols, especially this spring. Sea ice or lack thereof has a greater affinity to position the Cold Temperature North Pole. It is thus projected that Beaufort, Chukchi and East Siberian seas will have a thorough loss of sea ice, leaving the core pack more or less compressed against the Canadian Archipelago to a lesser overall extent than 2012. The larger question would be the North Pole? Would it be ice free? The answer to this very elusive , frustrating, furtive and difficult forecast will be at end of this page. General circulation conditions are foreseen in three distinct periods and completely driven by the location of the CTNP (s) and later by El-Nino which should warm but darken Arctic skies. Weather throughout the Northern Hemisphere will happen from where-ever the CTNP will be. 2 CTNP's (Center of capital "C" in purple) will essentially maintain a pan-Arctic dipole by the flow they create. More or less a continuation of winter past scenario, minus extremely long Southwards freezing flows. The jet stream will be frequently very North of Alaska dipping down at times at the Can-Am border further East. This should make Coastal BC wet with not so potent remnant Pacific in origin cyclones eventually merging and diluting Gulf stream cyclones towards Ireland and the UK (not so wet a spring there). North of Alaska High will be ideal for melting Pacific Sector Arctic Ice. the pan Arctic Dipole further. 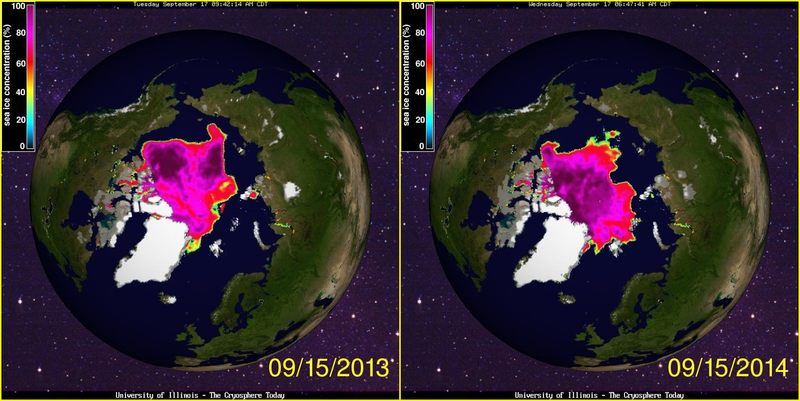 East-Siberian sea ice melt prime time. Not so good for Beaufort area with Bering sea now cleared of sea ice. Here we can realize N-E passage quick opening in the Pacific Arctic sector. Not so for Novaya Zemlya to Pole region where the ice will be largely immobilized and melting in place. Summer not wet 2012 style for UK and Ireland , but definitely cool and grey for Scotland as opposed to Souhwards. A Super hot Central North America is foreseen because of polar jet stream way in the Northwest Territories with Pacific in origin floes much more dried by a greater summer surface temperature-dew point spread. Central Canadian Arctic should be very hot by July. Merged single but weak CTNP roughly between Franz Joseph and Spitsbergen Islands, principally because of North Pacific and El-Nino warmth influence. Beaufort circulation again not so favorable , but with sun rays from clear skies damage done for months and warmed wide open adjoining open seas will make Beaufort ice free. 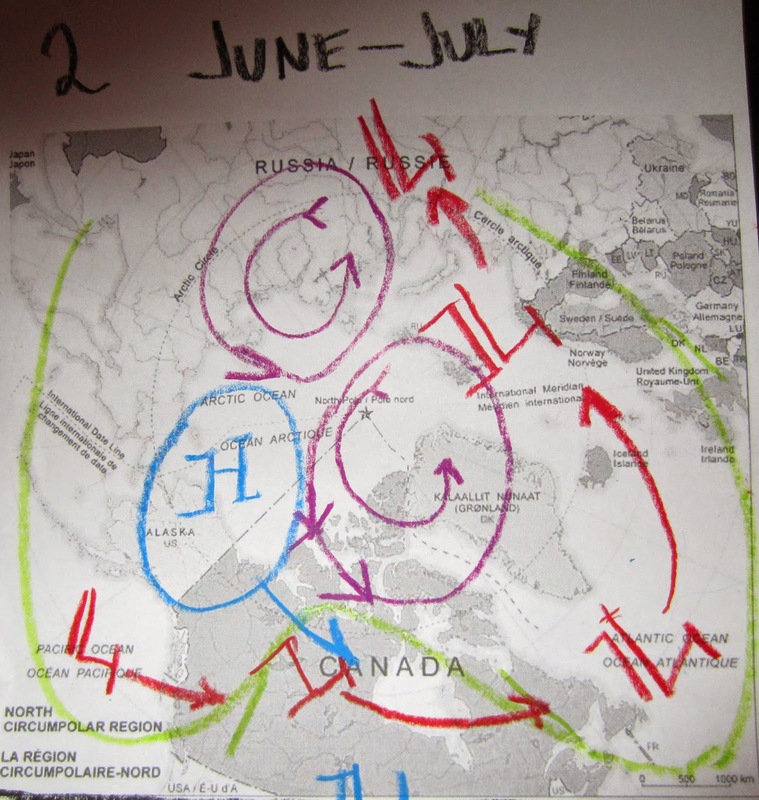 NW Pacific Cyclones will penetrate the Arctic Ocean 2012 style by mid-August. With the polar jet stream weak but regenerating come September. A CTNP in such a location should cause wettest period of the year for Ireland and UK. driest for BC Canada, and possible Hurricane diversion towards the NE coast of US. Arctic Cyclones moving Southwards will cool some parts of Russia and mid west North America. This despite El-Nino clouding the Arctic, Arctic Cyclones are not very good to foster tornadoes or severe weather. From this projection we can estimate Canadian NW passage open first, NE later with the often usual Kara Sea ice bridge block vanishing last. El-Nino and North Pacific warm sst moisture is the only feature promoting summer Arctic cooling, sea ice melt would have been much more vast if extra clouds are not promoted. However during period 2, El-Nino and North Pacific warmth will increase Arctic temperature to dew point spreads favoring clearer skies. There is a need for Cold Upper Air vs Hot surface air for tornadoes. The seemingly obvious lack of very cold Upper Air due to a very weak therefore warm Stratospheric Polar Vortex (just about to vanish), and much increased density weighted temperatures throughout most of North America is not favorable for a fierce tornado season at usual peek periods, so hopefully less of them than probability statistics would predict. Typhoons will be unfortunately great in numbers in the Pacific, while Atlantic Hurricanes may be rare but for very late in its season increasing the chance to be diverted by a High pressure block over the Atlantic favoring a landing Northwards. ~ Interpretations from multi-coupled thermal systems made simple by one horizontal line. a continuous accretion of sea ice only interrupted by passing warm Arctic Cyclones. 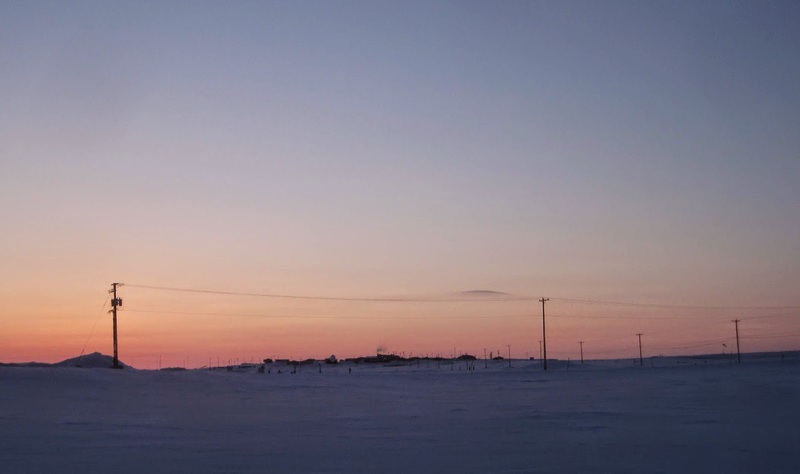 Following Polar long night sunrise, the sea ice horizon is always observed elevated compared to true astronomical horizon which occurs when the sea (ice/land) surface temperature is equal to the air immediately above. The main characteristic of the first underside melt is that it is observed never lower than true astronomical horizon unless the entire ice column temperature is greater than surface air. In Arctic Spring, sea ice is a "heat sink" because it tends to be always colder than sea ice and air, but when there is no longer thermal emissions from ice towards air, the underside melts. This gives an apparent "noon" pause in horizon height variations until the sun lowers in the evening, the horizon appears to rise greatly at every sunset or lower sun (when there is a midnight sun). The process usually continues the next sunny or even cloudy days until complete melting happens. From FM observation onwards the underside melt is usually observed to last gradually longer day by day, lasting a few minutes on the first day, eventually taking on hours as spring progresses. From FM onwards, sea ice may vanish if warmer air, water and sun rays focus on the colder ice column. Once the ice gone, the horizon may be observed lower than true astronomical horizon, this happens when surface air temperature is colder than sea surface temperature. This refraction based observation method helps analyze the true nature of the sea ice to air interface - it is an instant analysis of thermal geophysics spanning a huge distance. We look back, and find out the significance in yearly first melt dates. 2010 (top spring photo) had El-Nino during winter, FM's don't happen earlier because it's warmer, rather a matter of all thermal physics, from sea water, ice thickness, ice colour, snow coverage, air temperature, solar radiation, cloud cover, near surface convection/inversions, aerosols and finally the location of the Cold temperature North Pole over winter/spring. 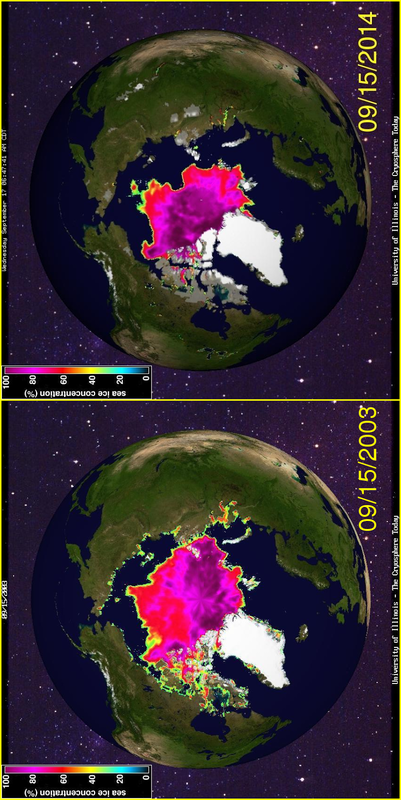 2010 had a particular first melt aftermath, excepting 2012, stronger and longer than the others. Over all sea ice was thinner. 2011 (2nd from top) had nowhere as warm a winter as 2012, the first melt was captured April 15, with following extremely consistent progressive melt periods (continuing all the way to a large minima decrease). 2012 was fascinating by earlier tendencies of near first melt occurrences by late February, it occurred on March 12, along with subsequent regular strong melting, as strong as 2010. But the clue for a great sea ice melt to come is in the tendencies towards the true astronomical horizon especially very early on. 2013 had very inconsistent post FM underside melting. Again the first date of true astronomical horizon did not matter as much as what happens before and after the recorded date. March 19 was early , but what followed marked the September sea ice minima in advance, there was no strong consistent underside thawing, despite regular adiabatic near refraction observations. Another clue of a very cloudy Arctic summer to come. Projecting the future Arctic climate more precisely requires multiple sets of different observation events. April 3 2014, no sign of any first melt, was late compared to previous year, local apparent noon picture (left) has just as high an horizon as 3 hours later. Vertical vertice horizontal lines are spaced 3.3 minutes of arc apart. 2014 was the year of the Polar Vortex made popular by weather medias. But what mattered was the location of the coldest atmosphere in the world. 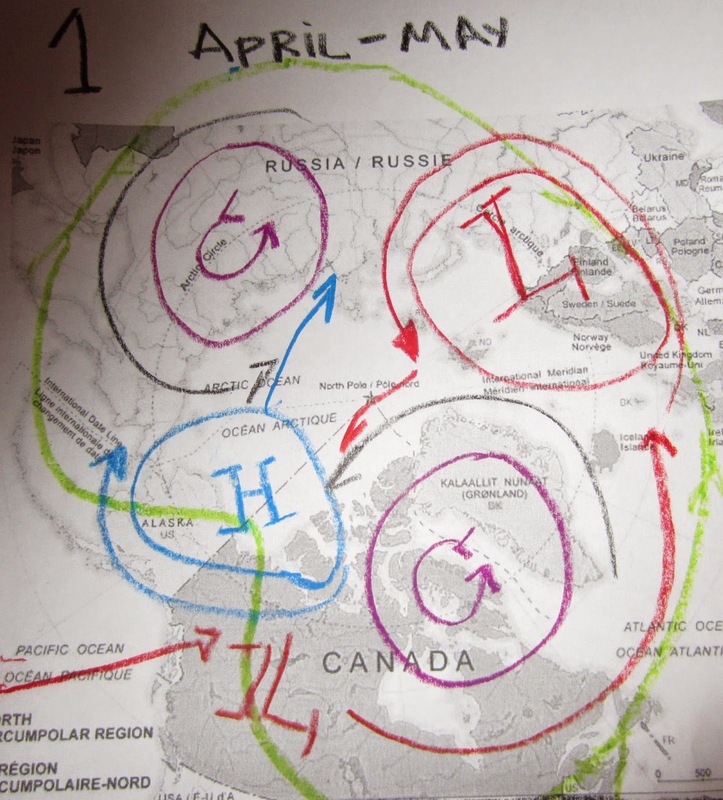 During Spring 2014, it was right over Cornwallis Island Nunavut Canada where the pictures were taken. What a difference a week makes. I interpreted this late FM (right) as the return of burgeoning anticyclonic activity, in part true, but it was equally the presence of the Cold Temperature North Pole, lesser clouds and aerosols. But subsequent daily melting was more consistent than post FM 2013. March 26 2015, NW passage first melt with some early tendencies nearing true astronomical horizon starting 2 weeks prior. Horizon height (left) is equal to whence the temperature of sea water and surface air was equal on september 10 2014 (right), the same horizon height has returned announcing melting and the open iceless sea to come. of 110 decimal elevation degree levels, 2005 had the most expanded sun disk levels followed closely by 2014-2013 and 2010. The warmest sun disk expansions in Arctic recent history (from 2002 to 2014) all occurred during the last 5 years at 61%, compared to the previous 8 years. If the whole Northern Hemisphere temperature remained average from year to year the yearly mean would be about 7.7%. " "NH Temperature Projection for 2014: 2nd warmest year in history without El-Nino, #1 warmest with a new El-Nino mid-summer onwards." NASA Giss Northern Hemisphere 2014 average temperature was #1. Sundisk differential refraction method scores another win, batting nearly 1000 in baseball terms over several years of such predictions. "Where will be this Summer's Cold Temperature North Pole? "The C.T.N.P. zone is actually the biggest single contributor of weather throughout the Northern Hemisphere, it is the heart of the Polar Vortex. There is CTSP in the Southern Hemishere which does likewise. As in March 2014 the CTNP was hanging a lot about mid central Quebec, and gave all kinds of "normal winter of old" weather. For the folks in NW Europe a summer CTNP at about Spitsbergen gives buckets of rain especially over the British Isles. But it seems likely the CTNP to hang about Northern Ellesmere and Greenland, because greater sea ice thickness over Arctic Ocean Basin has been and will continue to help spawn High Pressure systems there. CTNP over Northern Ellesmere should mainly position the jet stream to the Northwards between Iceland and Ireland. Although it looks like the rain will return to UK like the summer of 2012, perhaps less than but certainly plenty grey and wet. For the shivering Northeastern Americans, a nice very hot summer awaits, drier after a wet cool spring. But it is actually the position of the CTNP which will decide where the jet stream will meander. An Arctic Dipole will melt the sea ice greater than 2012, the North Pole will see open water, again like in 2013 when the North Pole was actually a zone of very loose pack ice, but this time the sea ice will compress or compact, leaving a wide open water view of a Pole area not exposed to open water for millennia." "But it seems likely the CTNP to hang about Northern Ellesmere and Greenland, because greater sea ice thickness over Arctic Ocean Basin has been and will continue to help spawn High Pressure systems there. " CTNP was over Northern Ellesmere and Greenland but also on the other side of 0 meridian over Franz Joseph Islands. 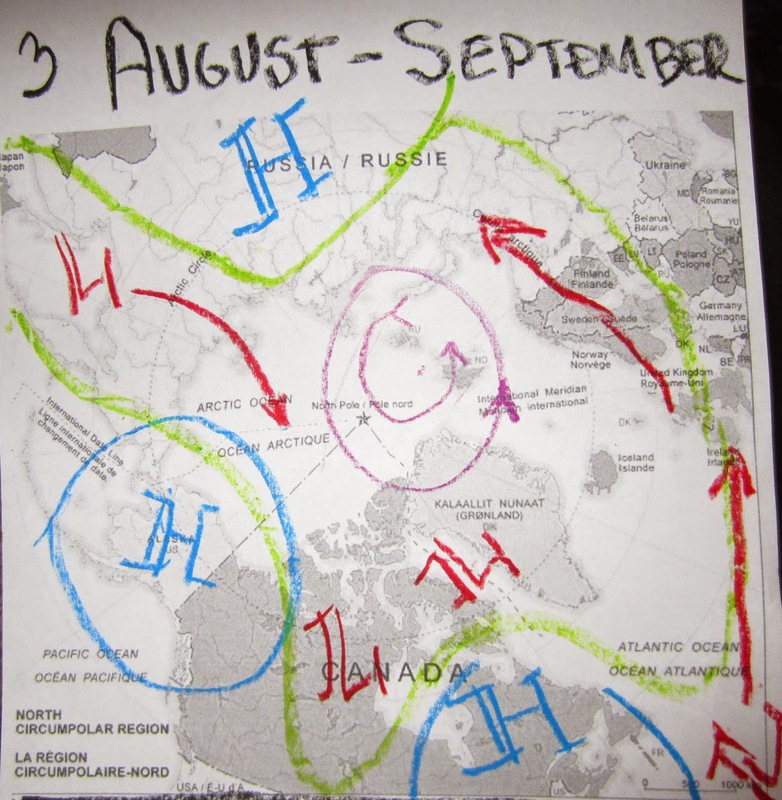 Explaining the polar circulation of the entire summer. The systems rotated slower than 2013, giving a chance for High pressures to build up over the Arctic Gyre area. have had a great melt because of the cloud coverage combined with anti Arctic Ocean Gyre circulation. Or Gyre shearing/stalling. the Gyre area. A definite pro-gyre circulation, making high pressure systems proficient given the lack of moisture input to create clouds over the entire 90 E and W quadrant towards the Pacific Arctic . The Ultimate melt scenario 2012, had the weakest circulation possible. on time to slow the onslaught. "An Arctic Dipole will melt the sea ice greater than 2012, the North Pole will see open water, again like in 2013 when the North Pole was actually a zone of very loose pack ice, but this time the sea ice will compress or compact, leaving a wide open water view of a Pole area not exposed to open water for millennia." pack at minima 2014 (deep purple above right) is likely the 2015 minima look. Last year saw the most violent typhoon in history, Haiyan. Last year also had no El-Nino as well as no Hurricane season to speak of, but there was a split personality syndrome; El-Nino to the North , La-Nina South of equator, this continues today:"
"Except there is a difference, the Polar Vortex has shown a dissimilar circulation pattern to last year, so expect a different result. The PDO especially from the North Pacific warming is 1.6 points higher. ENSO variations triggers weather but weather patterns affect ENSO moods." "April 19, 2014 Polar Tropopause clouds, higher than Cirrus some appear white some dark, these are reflections from horizontally Polarized light, they are a wild mix of chemical clouds, ice crystals and cloud condensation nuclei. If they exist higher in the sky during twilight the more likely El_Nino is happening. Right now, at about 7 degrees above the horizon they exist more from a very warm North Pacific and Atlantic, during an El-Nino they can cover the horizon sky for more than 40 degrees elevation. Already in the cards, more typhoons, less hurricanes than normal. If ENSO turns to be a completely formed El-Nino, the coming winter will be much warmer grey and wetter (yes lots of rain and snow), if the spilt personality continues (unlikely), a winter much like the one just past will revisit but with different CTNP persistent position,. WDApril 20-21, 2014"
A mild El-Nino ensued over this winter just past, CCN, PSC or PTC clouds (in photo right above) were not seen alike this spring (2015) in the wake of a small La-Nina Blitz in he Southern Pacific Equator. Which is just recently turning back towards El-Nino. There is a lag in seeding clouds appearance and or disappearance of a month or so. ENSO "split personality" at the equator languished at 2014 end of year. Beginning of 2015 was excessively cloudy in the Arctic. Only changing at the same time when El-Nino of 2014-15 weakened. 2011 stratosphere was indeed very cold which came along with a very strong Polar Vortex, was not the case in 2013 and 2014, this set a favorable fewer in numbers tornado season . This is the third yearly tornado projection which panned out nicely.